And I am on cloud 9! I have really gotten quite a bit done recently... Some of these are for the crop over at Simply Obsessed , two worked for the guy challenge over at Coordinates , some where just to get me scrapping again! 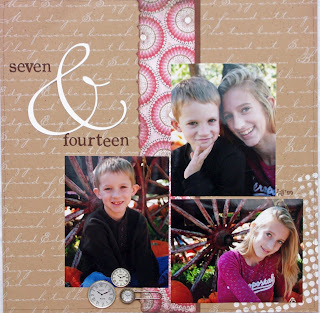 Seven & Fourteen: This was a "just to get scrappin' layout! 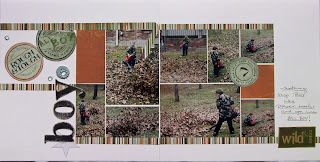 Used my craft robo for the ampersand and looked for TWO plus hours for the stamp to use behind the photos! Love it when I use OLD paper like the BG strip! Clean out those supplies! 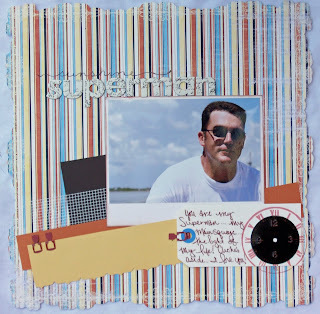 Sunshine Superman: This was for both sites... worked for the Song Title challenge and the guy challenge! It Came True: Just because... 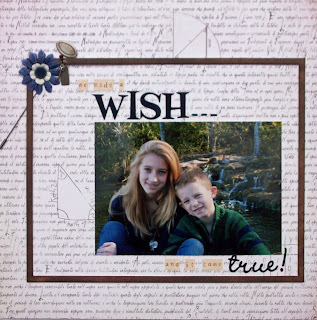 I used new Basics line from BG for this and an old Technique Tuesday tile for the frame... and check out my QK... haven't used those fonts in a while! 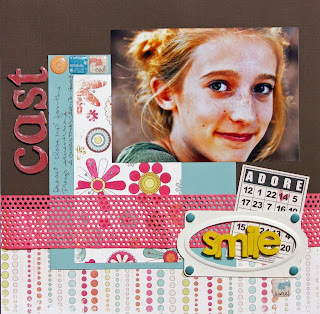 Hello: Many, this is probably one of my faves from this journey through scrapping! And it really isn't much! I used a background stamp and swirl stamp to make the photo mat and covered old Maya Road chipboard letters with MME paper! Rest is my handwriting! Photo was taken as we were walking out the door for her 8th grade graduation! Cast: At SO they had a pre-crop challenge to see if we were Sandy or Sandra Dee - I am a little of both! This is my Sandy challenge! It was supposed to be a black background, but the Sandy in me chose to use brown instead (that and the fact that once I saw the paper in daylight I realized it was brown not black in the PP) How old is that Magic Mesh and Smile thingy - OLD! This was her cast photo for her school play. 4TEEN: And here is my Sandra Dee with pink background, ribbon, and flowers! Not over the top girly, but fits E just fine! This shot was taken when we were doing the Christmas card shoot! 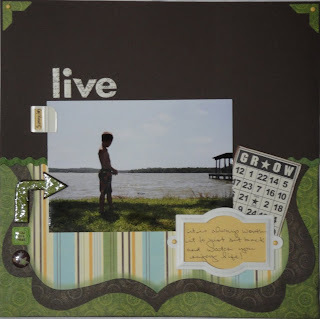 Boy: Another "guy" layout for CC! Nothing on this page is new including the photos! hehe I handcut the circles from the patterned paper, raided Chuck's tool box for the metal pieces, and found the ancient MM fabric tag that matched perfectly! E is home... home... HOME! I am thrilled that she is! She has been given the job of gutting her room, so that we might be able to make it look more like the room of a high... high... are you really going to make me say it? A high schooler's room! T and his team won their tournament in that heat! They are now two championships into the summer and have two more tournaments in July and possibly THREE come August! It will be hot, but I LOVE it! I go to the doctor for my post op appointment on Wednesday... I am just ready to drive and be able to say I can go somewhere if I want to go! Honestly... I am digging the jammies all day, scrapping, and lazy cleaning! It is too hot to be running around! I want to scrap and work on my curriculum a bit! You don't sweat as much! Surgery went off without a hitch... except for one thing! I do NOT sit still very well! I am feeling pretty strong, but I know that things are going on inside that I need to be careful with! But it is summer, it is hot, and I am just going to stay home (not allowed to drive for TWO weeks) and watch movies, scrap, and try to keep the monkeys from killing each other. Monkey #2 doesn't come home until Friday, so this week will be a little bit easier! T's baseball team is out there playing their hearts out! They are doing pretty well in this heat and should do really well in this tournament this weekend. I am sad that I am missing such a big tournament, but secretly it is HOT! I have others to see... I can't wait! 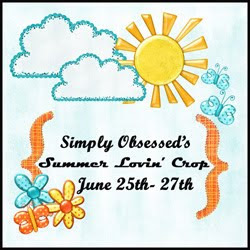 Something else to keep me busy this week... a new little site I found Simply Obsessed is hosting a Summer Loving crop. It looks like it will be fun and a great way to keep me still at home! Go check them out... it is a sweet little site with beautfiul kits and great ladies! To back up a few weeks... T and his team played five games back-t0-back in the Texas heat to win the championship for an area tournament... Much different than Little League play. Man that is some intense ball playing! And they are only SEVEN! Then my baby "graduated" from Middle School and is heading off to our high school as a ninth grader in the fall. Man... are there some good times in her future! I can't believe how old she has gotten! Actually got some scrapping done... some firsts since my back surgery. It felt so good to be able to get in there and work! I can't wait to get in there an get some more of this pile of photos scrapped! Will post the others later! 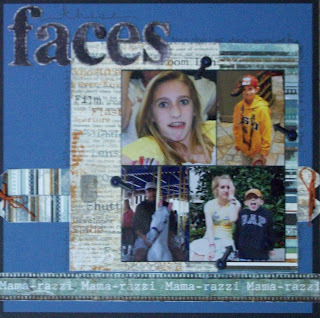 Faces: used the Momma Razzi line for whatI thought was "perfect" photos of my family. I think that they are just tired of seeing my camera in their faces... whatcha think? Live: this was a picture I got of T playing with his RC boat up at Mom's! Something about his stance just makes me catch my breath! Love this kid! Fresh: This is E at the end of sixth grade... I finally got around to scrapping this photo! Amazing to see how much she has grown in two short years! But what a zest for life! Love this one too! After school ended, we headed for some laid back fishing at the camp... hmmm... a tiny little oil spill stopped us from bringing home dinner! Sorry babe, I know you were looking forward to that trip! Maybe towards the end of summer, we can try again! Love you!